THE BOWL – The roundback bowl design is the distinguishing feature of the Ovation guitar. The Lyrachord composite semi-parabolic design creates a guitar that is durable and rugged. More that that – it is louder, more focused, and provides greater projection than standard ‘box’ guitars. Contour Bowl – The newest addition to the Ovation line is made from lightweight composite, the Lyrachord GS body produces maximum acoustic response, with the feel of a smaller body instrument. Designed to fit the contour of the player’s body, this new innovation is available on the 2005 Collector’s edition and select LX guitars. Deep Bowl – The deep bowl size produces the fullest acoustic sound with deep bass presence. The larger size gives room for the creation of a penetrating acoustic tone favored by acoustic players, though the deep bowl configuration still matches up equally when plugged in. Mid-Depth – The mid-depth bowl is the perfect blend between the deep bowl and super shallow options. The smaller size fits some players more comfortably, but the mid-depth retains impressive tone projection while playing acoustic. Super Shallow – This slimmed down option gives you a clear acoustic sound, while allowing for an extremely comfortable feel and ease of playing. The super shallow produces all the volume needed for any venue when plugged in. 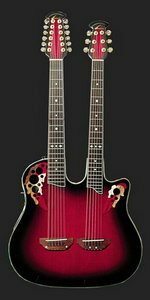 Ovation selects only the highest quality top materials for their instruments, choosing the soundboard materials that produce the vibration and project needed to generate the signature Ovation tone. Spruce – Spruce is choosen for the majority of soundboard because of the balance, depth, and power. It delivers full mid-range tones and brilliant high tones. Our spruce wood is graded as A, AA or AAA – with AAA being the highest designation. The grading reflect the characteristics of the wood, with the higher grading going to those with more consisent color and uniformity in the grain pattern. Typicallly, slower grown wood shows a straigher, tighter grouping of grain.Each grade of spruce still carries of fundementaly solid tonal range. Bearclaw Spruce – Spruce is given the name by the patterns in the wood grain that give a sporadatic ‘bear claw’ print appearance on the wood. 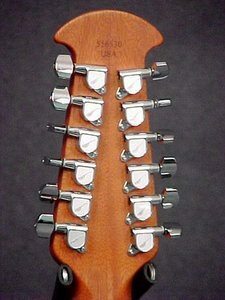 This cosmetic attribute provides a distinct look on the guitar soundboard. Solid Cedar – Our solid cedar tops produce a slighting different tonal voice than the spruce soundboards. Cedar is known to produce a richer low end sound, but still maitaining solid overall balance. Figured Koa – Koa is an exotic wood of Hawaain origin, choosen for guitars for both visual and tonal reasons. The materials itself comes through with complex patterns and color variations, creating one of the most distinctive impressions up close or on stage. The wood is highly resonate, greatly accentuating high end tones. Quilted Maple – Quilted Maple guitar tops are the choice of those who want to make a immediate impression. The wave-like patterns in the wood grain jump out when a finish is applied, leaving a stunning impression.